The Planning Authority has rejected plans to add two storeys to an old building in Valletta’s historic Biċċerija quarter, which objectors had warned would “physically mutilate” the existing fabric and destroy important viewpoints. The board voted against the proposal by six votes to two, despite project architect Ray Demicoli's insistence that the development would fill in a gap on the Valletta streetscape, "like a dentist fitting an implant in place of a missing tooth". The building in Triq il-Gendus, close to the lower end of Old Bakery Street, forms part of a block which is almost completely made up of the Grade 1 scheduled Old Civil Abattoir. The proposal would have added two floors and opened new apertures on the facade, as well as internal alterations for the building to be used as offices. The Superintendence for Cultural Heritage, which objected to the proposal, described the building as one of “historical and architectural” value and noted its proximity to the scheduled Auberge de Baviere. Photomontages presented by the developers showed that the extra floors would obscure the side view of the Auberge from the Valletta fortifications, and the SCH has said it would have a negative impact on the surrounding streetscape. 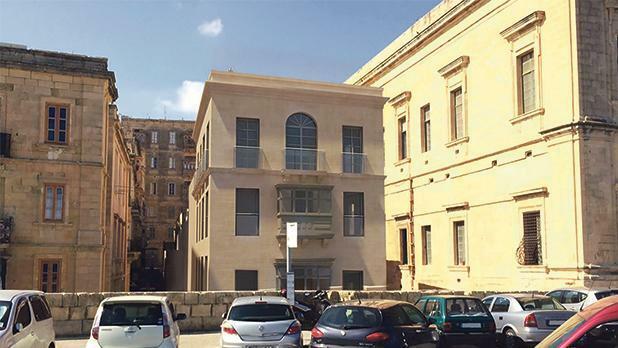 Issues pertaining to sanitary regulations have also been raised, although the architect argued if brought in line with sanitary laws, the building volume would not respect the characteristics of Valletta. Reuben Grima, a nearby resident and cultural heritage professional, said the proposal would see the building’s existing historic fabric “mutilated beyond recognition”. He said the current height limitation of the city block allowed for extensive views of the Auberge de Baviere from the perimeter road, which would be blocked by the additional floors, which would set a damaging precedent for the surrounding area. Valletta local council architect Claude Busuttil said during the hearing that the plans failed to respect the terracing of the street, which sloped downwards towards the lower levels closer to the sea. Din l-Art Ħelwa also objected to the proposal. Project architect Mr Demicoli argued that the negative assessment by the SCH had been influenced by “incorrect representations” made by objectors, whom he said had an “underlying negative attitude to change” that ran counter to Valletta’s designation in planning policy as a living city. The two board members who supported the proposal, against the planning directorate’s recommended refusal, argued that the prospect of regeneration outweighed any negative impact the extra floors might have.